Zombie Virus (Pithovirus sibericum) under a microscope! Even death won’t stop this virus from replicating! FACTS: When French scientists Jean-Michel Claverie and Chantal Abergel learned that plants had been revived from 30,000 year old seeds found in squirrel hoards buried deep in the Siberian permafrost, they requested frost samples from the Russian team. They then tempted the samples with fresh amoeba, and were able to lure dormant viruses hiding in the frost into action. The viruses attacked the amoeba, bent them to their will, and started using them as replication laboratories. 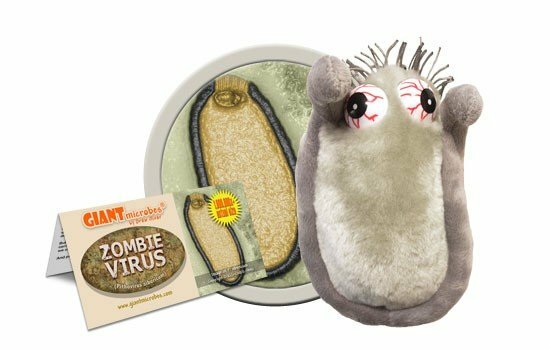 Fortunately, it appears that the primary threat that this zombie virus poses is to the microscopic amoeba population. 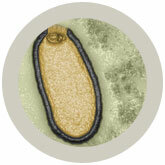 Nevertheless, the scientists have also discovered other large viruses, including Pandoraviruses and the "microbe mimicking" virus, or Mimivirus. Although the pathology of these viruses is as yet unknown, antibodies to giant viruses have been detected in humans – which means giant viruses can make us their hosts. 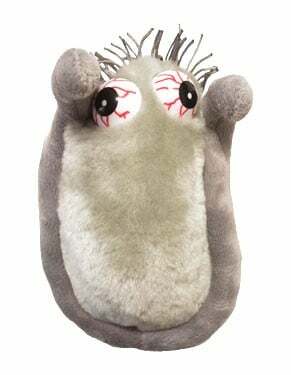 Copyright © 2015 Giantmicrobes, Inc. All Rights Reserved.